There are few things I’ve encountered less stressful than waiting for a newborn’s arrival with a toddler at home and a husband who works in a field where his days aren’t spent in one place. While I have a long commute, I’m blessed with a job that ensures I’m always in the same place if a family emergency arises, and we made the choice to keep the kids in daycare near me for that reason. The only time we feel the strain is when Jason is the only one who can respond to family emergencies (like driving a laboring wife to the hospital). It worked out fine with A because I went into labor overnight and our only responsibilities were Abby (our Australian Shepherd), three cats and the pile of chickens. They were all able to keep a few hours until my mother in law stopped in to pick up the dog and water and feed the others. Expecting with a toddler is a totally new game – one that had him out of work yesterday in a dreadful snowstorm because early labor is just dragging on and neither of us are keen to deliver a baby in our Subaru on the side of a road because we got such a late start to the hospital. We are fortunate in good neighbors and family who are all willing to take A at a moment’s notice, but the constant mental gymnastics of who can we call if X happens is starting to take its toll. We have a plan, and a back-up plan, and my doctor’s reassurance that we can bring her to L&D with us if we need to, but I don’t think I’m going to feel fully settled about any of it until Baby M is here, and we know exactly how the nex t 48 – 72 hours are going to play out for our sweet girl, who is so very excited about her brother’s arrival. So what are we doing to cope with the waiting today, given that the house is about as immaculate as it can be with a toddler in full time residence, the freezer is full of homemade meals, and the hospital bag is not only packed but also in the car (where it has been since the first false labor scare of two weeks ago…ugh). We’re going to town – to do some shopping and walking and have another Mama/Toddler morning because A deserves all the time she can get before her little brother arrives and throws our routine out the window, and I’m trying to remind myself that things will get more difficult to manage before they get easier, even if it’s uncomfortable to be out and about at 40 weeks. And until A wakes up after last night’s rough night of sleep, I’m going to sit back and enjoy what I’m hoping might be my last quiet cup of morning tea with only one little one to care for. Today marks the beginning of another school year, and though I’m excited to get back into the classroom, I feel much less so about leaving A. She has great daycare, but my schedule this year is a little tighter than last and lands us at home around 4:30 every day, instead of 3:30. A celebrated last night by waking up about five times — thank God Jason is the one who does the back and forth to the crib, or I’d be an even more tired Mama. Along with the return to school comes the return to pumping and scalding my milk because of the extra lipase that makes it really disgusting for poor A if it’s frozen (tastes just like soapy water). I’m hoping to post about that soon, but it’s such a process that the thought of taking photos of it has been overwhelming in the past. In terms of exercise, I maintained last week, dropping about a half pound, despite not tracking food via WW and just enjoying my last week of freedom with an evening beer after the little one went to bed most nights. I did complete T25 Beta, but ended the week with so much hip pain and lower back achiness that I’m taking a week off to focus on yoga and core building. I’m not sure my post partum body was ready for Beta yet (even though it seemed really fun! ), and I’m considering another round of T25 Alpha before I move on. A lot of reading I’ve done suggests a week off between Alpha and Beta to protect knees and hips from the jumping, but I’m still weighing my options once I get through seven days of twice daily 20 minute yoga work. Survive the 4 a.m. Alarm Clock – One Day Down, Four to Go! Live healthily by packing my own lunches, drinking my new Klean Kanteen of water (40 ozs) at work every day, and getting in those 40 minutes of yoga. Make dinner every night – no takeout! We did takeout pizza last week, and I felt so gross afterwards… then we did pizza on the grill at home and it was So. Much. Better – no grease, healthy toppings, happier tummy! 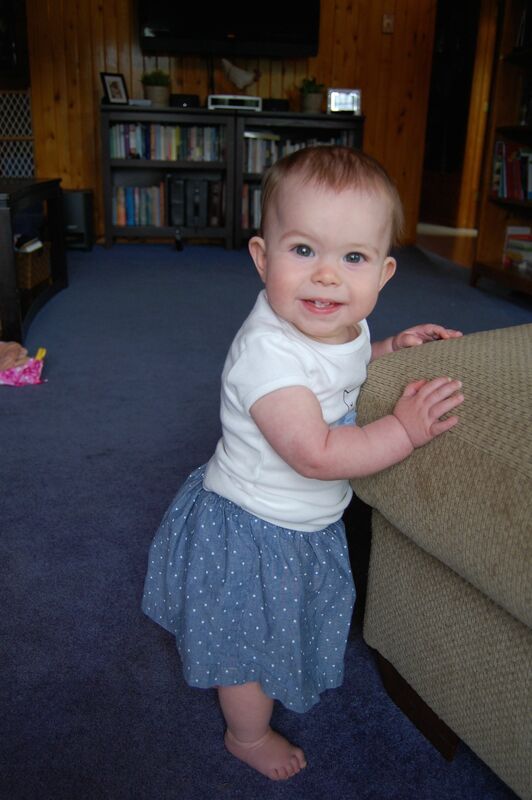 Amelia also turns ten months this morning (5:17 a.m.) – where has the time gone? Happy Ten Months Old, Sweet Amelia! One of the biggest factors that allows us to forgo takeaway so often during the very busy school year is the amount of produce we are able to put up during the late summer months. While having a baby has definitely altered the shape of our days (and the amount of spare time I have), we are still going strong, preserving vegetables for the upcoming winter months. I’ve posted previously about preserving green beans and zucchini and summer squash, but one of Jason’s favorite vegetables is peas. Before starting, make sure you have enough space for two cookie sheets in your freezer, as you need to flash freeze peas BEFORE placing them into bags. Pick your peas on a day when you have enough time to process them start to finish. 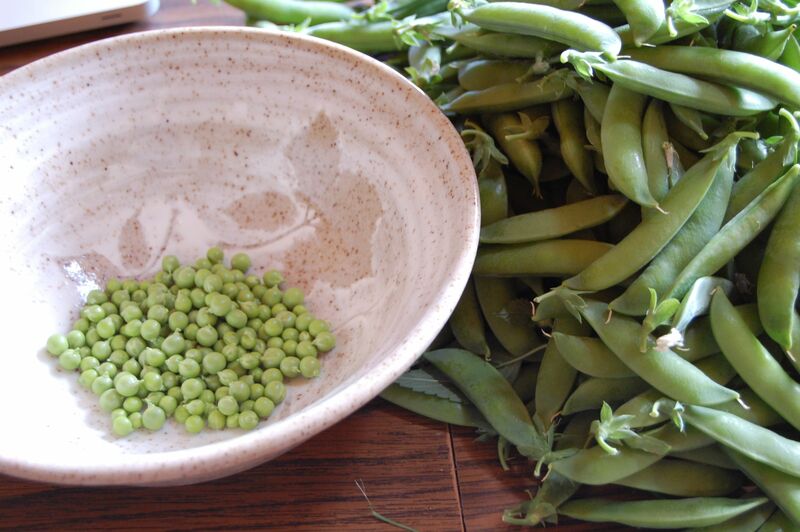 Pick the pods, shuck the peas, and get started preserving. If you must, I’ve found that shucked peas are okay in the fridge, covered, for 24 hours before processing. Fresh Peas from the Garden! Bring your water to a rolling boil. Meanwhile, prepare your blanching sieve and pans (cover with a fresh dishtowel). 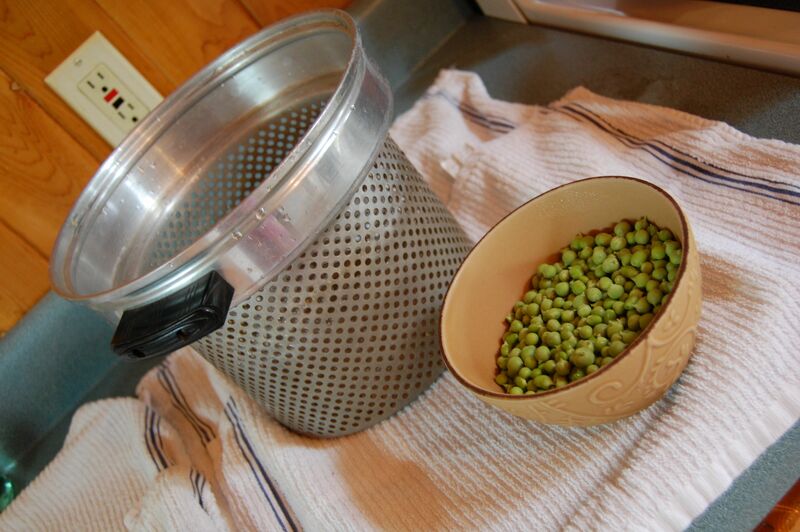 Blanch peas (this is where I use the metal sieve) for 2 – 3 minutes, until the color changes to a rich green. 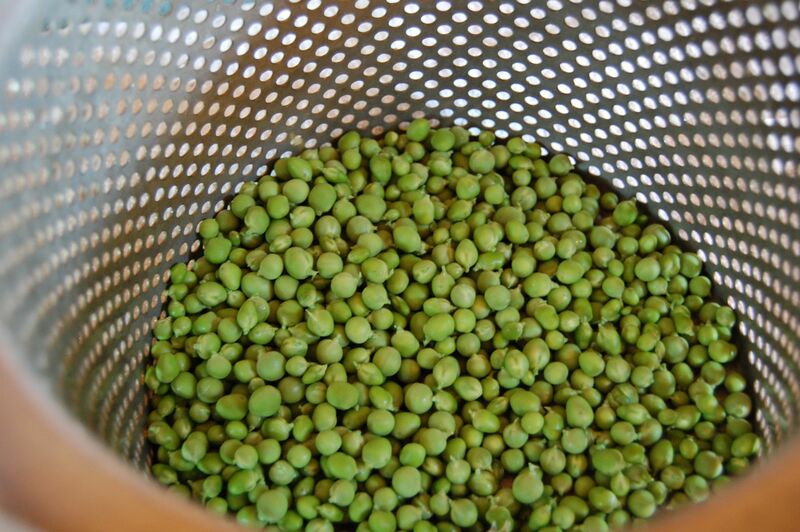 Place blanched peas in an ice water bath to cool. I usually just lower them into ice water in a pot while still in the sieve, so I don’t have to strain ice out of them before drying. 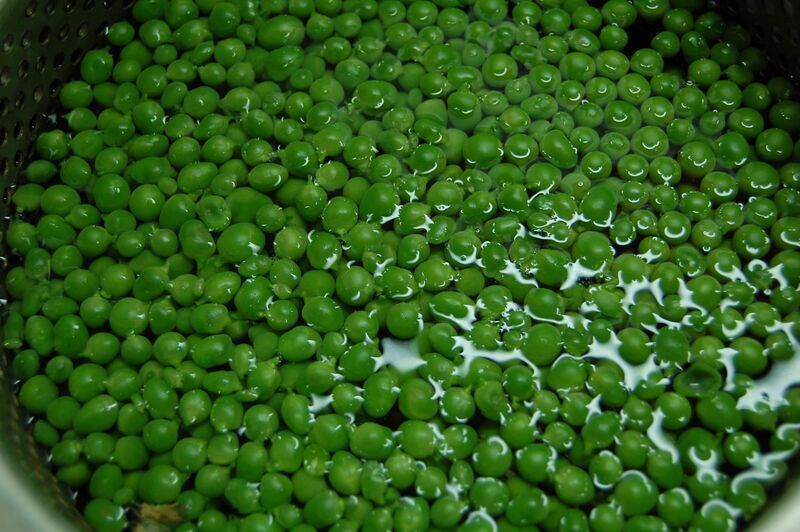 Leave in ice water until peas are cool (3 – 5 minutes). 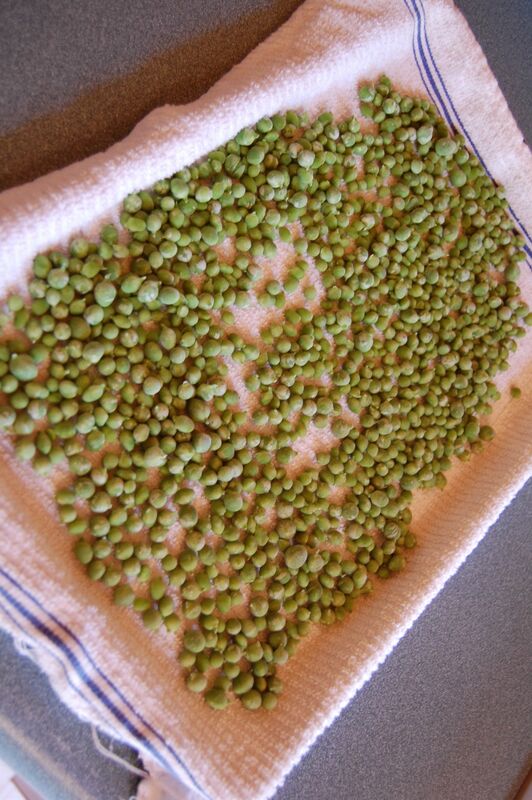 Transfer peas from the water bath to dry dishtowels, then roll peas on dishtowels into logs to hurry along this process. 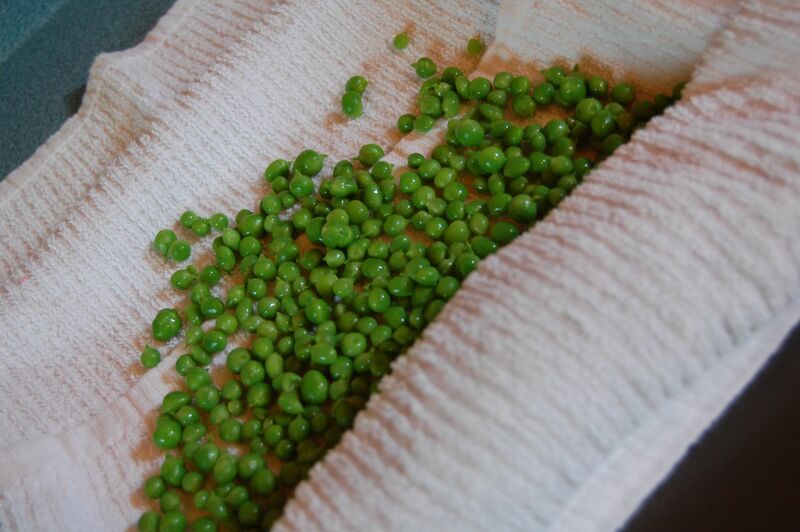 Peas, rolled into a dishtowel to remove water. 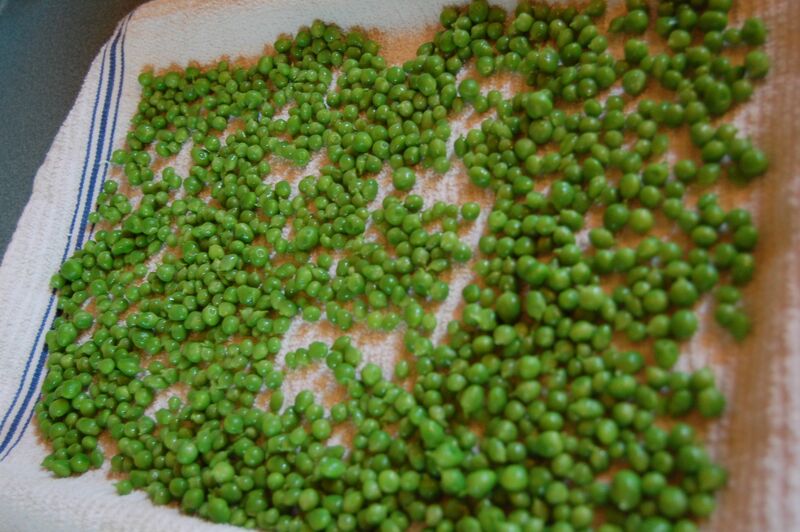 When dry, spread the peas on a clean, dry dishtowel on a cookie sheet. Place in freezer until frozen solid (6 – 12 hours). 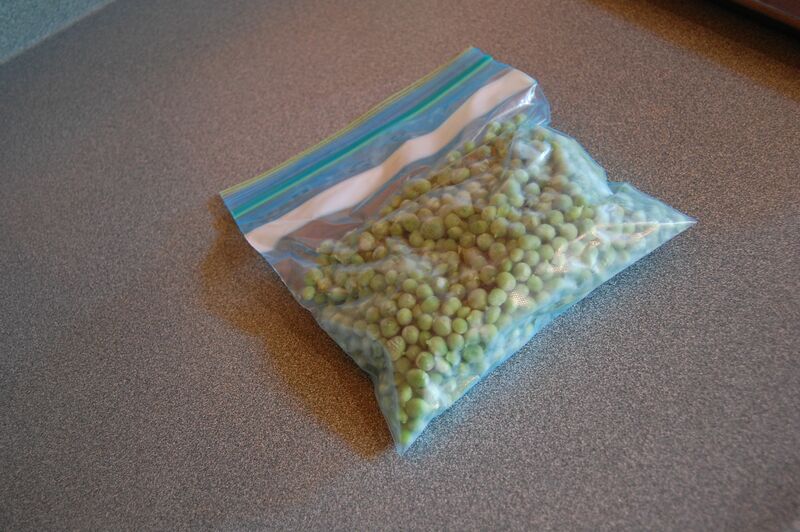 Loosen peas and transfer into freezer bags. Remove air from bag and place in freezer. Peas, ready for the freezer! These peas can be used in cooking all winter long, steamed or placed in the microwave and served plain. Enjoy! I know we will! I’m feeling a little low as I write this, having just waved goodbye to my mother and younger brother. We had the best weekend, and even though we got a little off track on the healthy eating (my mom is an awesome cook! ), I still managed to lose another pound last week and finish the full T25 Week Four lineup. Hanging with the family before they headed south. Continue to drink more water … I’m really struggling to get to that 10th glass every day. Live in the moment – summer is fading fast! Start getting up at 4 a.m. and working out to prepare for the return to work. Sigh. Try to get to the blueberry fields. Hope you’re enjoying a lovely summer Monday! Somehow, another week has blown by! I look back over last week, and how much we accomplished even though Jason had to spend the entire weekend working out at his dad’s house in preparation for its inspection, and I am so thankful we’re still balancing things. Cords have been picked up and put away, more baby proofing has been accomplished, and I finally got to those pesky floors! And, by some grace of luck, I managed to week and mulch our flower beds and stain the decks before we had company last Friday night. But to get down to the purpose of this post… last week’s meal planning went great, and A ate what we ate (or what I had planned for her) every night of the week! 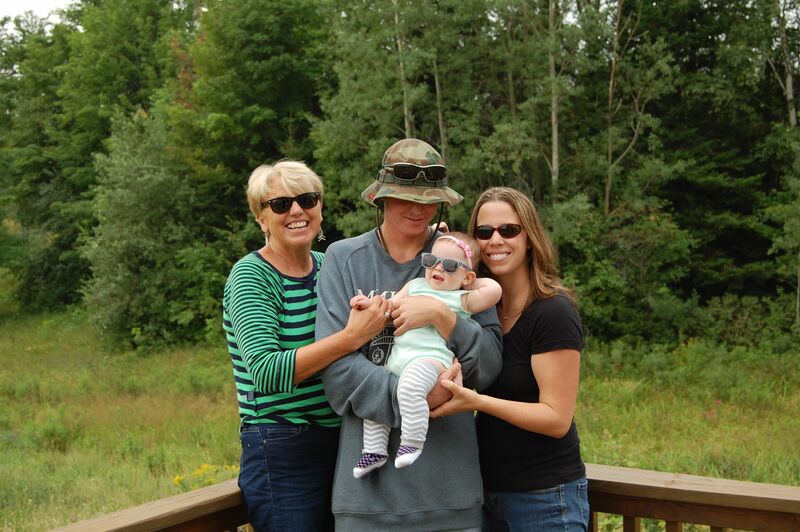 This week, we’re getting ready for a visit from my mom and brother (Amelia’s Uncle Sparky). They’ll be arriving Friday night and staying through the weekend, and since Uncle Sparky lives in LA, this will be his first time meeting little Miss Amelia. I can’t wait! In terms of how things are going… I fully completed Week 3 of T25, and with the addition of more careful eating practices, I am down 1.5 pounds! I’ve noticed some hip pain this weekend, but I think it’s just my body continuing to adjust. We’ll keep our fingers crossed! Eating healthily is so much easier with all of our own fresh veggies finally coming in! This week’s We Eat/She Eats focuses a lot on what we can get out of our own garden at this time of year: onions, garlic scapes, zucchini, and cucumbers. The tomatoes and corn are coming, albeit very slowly! Amelia is also loving watermelon or watery-melon as I call it when I feed her, so we’re going through about one a week, and it makes such a great, healthy snack for Mama, too! Friday: Mom & Uncle Sparky Arrive! What are you and your little ones enjoying the most this summer? Though it took me several days to make it (for some reason it fell out of the rotation last week), we had a real We Eat/She Eats success on Sunday night when A ate exactly what we did – organic chicken sausage (with sun dried tomato and basil) sauteed with organic zucchini and red pepper over pasta (hers was all cut into tiny bites), garnished with fresh grated Parmesan cheese. She gobbled it up and finished it with a side of Greek yogurt with pear sauce. 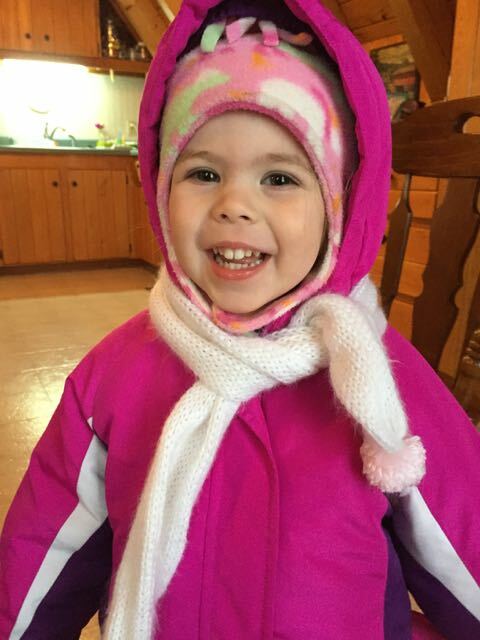 She also ate a great lunch on Sunday of turkey (chopped), blueberries (diced) and cheddar cheese with a few Cheerios. It’s really interesting to watch how much more delighted she is with more seasoned and flavorful food. 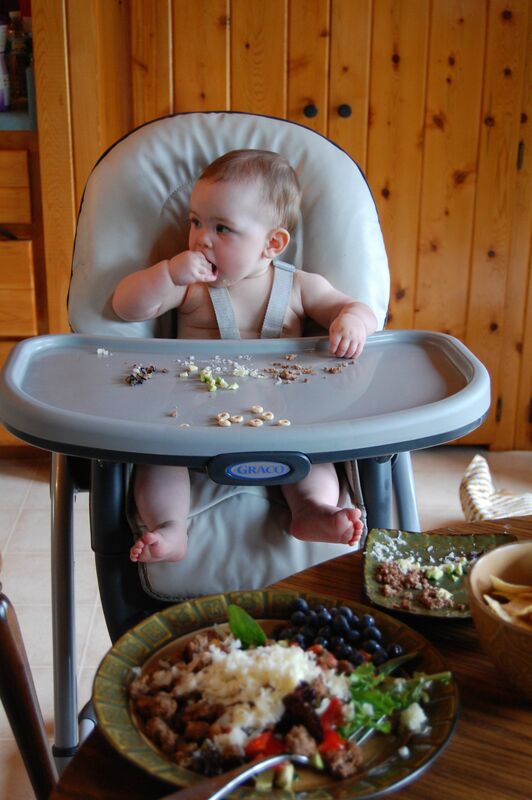 Here’s hoping we’re raising an adventurous little foodie! In other news, T25 is still going great. The scale still hasn’t moved much, and since balancing nursing with weight loss is such a struggle for me (I’m back at my pre-pregnancy weight, which I’ve maintained since doing Weight Watchers this past spring), I’ve decided to commit to three more months of WW to see if it can get me to my goal weight. I went off when I traveled home to Vermont, knowing that I didn’t want to pay for two weeks during which I’d probably slide off program, but I’m ready to finish slimming down in hopes that a little less weight might ease up the last of my residual back pain. I should note that all of these dinners are pre-tracked in my WW calculator, something that I’ve had really good success with in the past. I tend to eat the same breakfast every day, and knowing what dinner will bring allows me to make better choices at lunch and in the early afternoon, when I tend to be most snacky. We Eat: Chicken, Sautéed and cooked in Seeds of Change Masala Sauce over Brown Rice with Broccoli and Garden Peas! What are you looking forward to cooking this week? It feels sacrilegious that I’m writing our weekend wrap-up on Sunday morning, but that’s sort of how the whole weekend has felt. We had an awesome dinner with friends on Friday night, but Jason and his mom have had to spend the entire weekend (and nearly every weekend this summer) out at his father’s house preparing it for sale (we’re under contract! ), which has made for a weekend that, frankly, feels a lot like the middle of the week. I’m not complaining, but it has lent a different feel to the days, particularly since A loves her Daddy so much. We did sneak in a lovely dinner last night (pizza on the grill) and a quiet early evening together before A woke up for an hour. When she did finally go down, she slept through the night for the second time ever, so this Mama’s keeping her fingers crossed that it happens again. Since the summer is slipping away so quickly, I wanted a quick list of things that I’m hoping to accomplish this week. Not having to drive into work should definitely help with the getting things done, but it’s also that time of the summer where I usually start devoting my mornings to lesson planning again, so we’ll see how it all goes. Put away A’s Swing. She hasn’t used it in more than a month, but it’s still set up in her bedroom and taking up a TON of space. We’re thinking #2 needs to wait a year or two, so it’s definitely not something I want under foot until then. Re-cord the living room entertainment system. There are so many wires behind our bookshelves, and A has taken to trying to get them. I also need to figure out some kind of charging station for the laptop because the old cord across the living room floor to the coffee table is an accident waiting to happen. Wash the kitchen floor. Seriously. Scrub it on hands and knees. Because if A isn’t crawling on it, she’s licking it like her best friend, Abby the Dog. Find a solution to the mail on the kitchen table nightmare. So much mail. So little organization. I’m thinking some sort of organizer I can hide away in my kitchen closet. Ditto for a purse hanger. I need somewhere other than the floor to set my handbag when I come in. Put together Katie’s Bridal Shower gift – I’ll share this one with you after her shower on August 2. 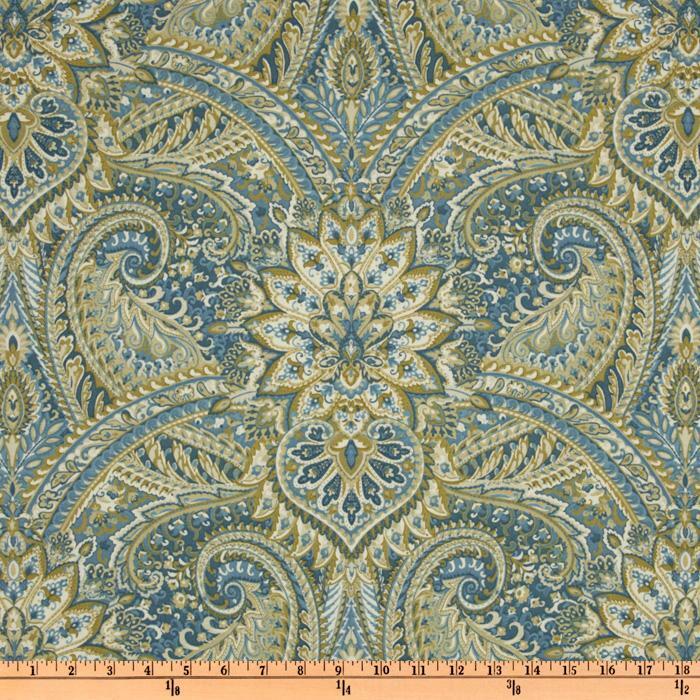 I doubt I’ll get to it this week, but I bought 15 yards of fabric in April, and my living room still has the ugly Roman shades that have been up since… Jason bought the house ten years ago. Finish Week Three of T25 – Weeks 1 & 2 are complete. Keep harvesting peas. Yesterday, I picked, shucked, prepared and froze two quarts. All during nap time. 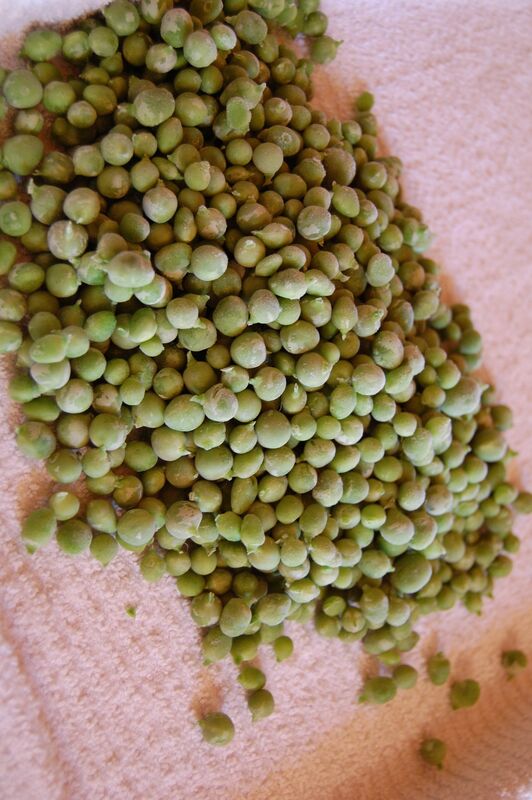 I’m hoping to do a Preserving the Harvest blog post on how to freeze peas that taste sweet and fresh all year long. What are you hoping to accomplish this week? 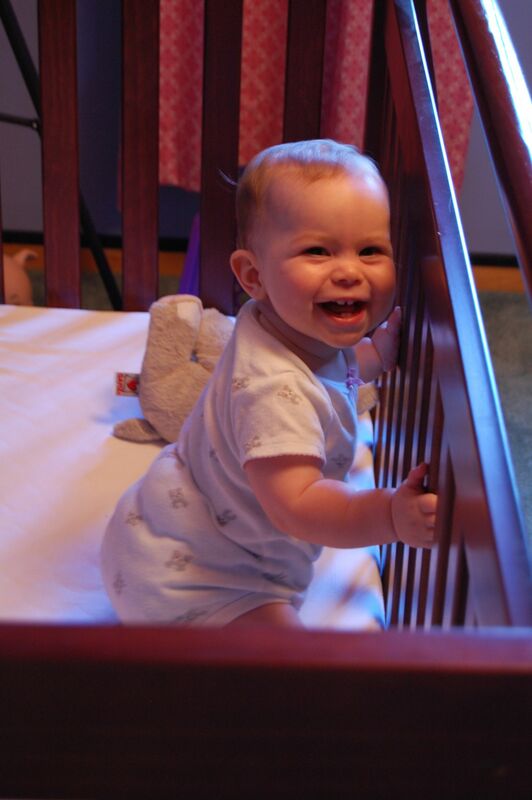 Amelia is working hard on standing up in her crib every chance she gets! Continue to eat less sugar. We did okay last week. Then I baked a batch of cookies. Keep pushing the water. It’s hot and so hard to keep up with nursing A while remaining hydrated. T25 is going great so far. I finished week one, getting all of my workouts in and doing the Sunday Stretch workout, as well. I feel great and my back pain finally seems to be receding. I haven’t noticed any major movement on the scale, but I have a lot more energy and a lot of muscle to rebuild. Wednesday: I have to work, so I’ll prep Jason and A’s dinner before I leave. In the spirit of truthful reporting, we managed to follow our menu exactly last week, except for Wednesday when I had to work and I came home and made French Toast for dinner for myself, mac and cheese for Jason and pasta bits, peaches and yogurt for A. This is the entire reason why we’re doing a freezer meal for when I work on Thursday. Gone are the days of putting A on her play mat in the kitchen and cooking while she watched on her back.